So, you’ve found our website. Perhaps you’ve watched a video of ours or someone else’s. Perhaps you’ve taken a class or two. Whatever the source of the introduction to the subject, you’ve decided you want to learn more. So here are some suggestions on how to do that. As soon as possible, get some friends interested in learning with you. It will be much easier and much more fun if you have a few people to work through the moves with. If you don’t know potential sword-geek friends at the moment, look into local medieval clubs like the SCA, or local HMA groups, or even LARP groups. Perhaps you’ll locate a Fiore group near you! If not, I don’t recommend showing up and telling an established group that they should drop what they’re doing and do Fiore with you, but you can probably find a few curious people that will be willing to take a look at your new interest and perhaps join you in learning some of it. You’ll want some basic gear like swords and daggers. Some 1″ diameter dowel rod with blade handles and edges marked with tape or markers can get you started. A LARP or SCA armored sword could fit the bill if it is of similar length and weight to a real sword and you already own it. On our other resources page we have links to buy the $15 plastic daggers and $35 plastic swords that we use for our classes because we could afford to own a half dozen of each. Wooden wasters are certainly nicer and start in the $50 ballpark. I own a SCA-rapier legal longsword that I use on the SCA cut and thrust field that I paid $300 for years ago. They now start at $375 from Darkwood Armory. Please, start cheap and gradually upgrade so that have enough experience to spend your money wisely. I also recommend eye protection. I bought this package of shop safety glasses from Amazon for use during our classes. There is a list of recommended books on the other resources page. I’d suggest starting with Robert Charrette’s book as it is accessible and comprehensive. As budget permits, pick up a facsimile and translation of the Getty version of Fiore’s book, then expand from there. One excellent way to start to learn Fiore’s terminology is to download and print our flashcard sets. At this point, use them just as you would vocabulary or spelling flash cards to practice matching the words to the positions, actions, or situations. You can either double-sided print the cards out on cardstock and cut them into finished cards or you can print the sides separately and glue/tape them to index cards. 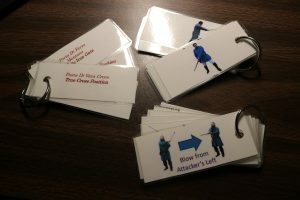 For our classes I have both a prototype index card set and a laminated double-sided print set. Final color, double-sided flashcards. I laminated my sets since I use them a lot, punched holes and added removable clips to keep the sets together. Note that each set uses different colors on the text side in case they get mixed together. directed random slow-work using the posta flashcards. Fiore explains his system using a logical progression of theory and examples. The example combat sequences are called plays. Large portions of Fiore’s book as well as the modern interpretations are used to describe these plays. About two-thirds of the time in our in-person classes and about two-thirds of the videos on our YouTube channel are devoted to teaching and practicing these plays. Lots of other groups have posted videos of Fiore plays so if you want help with a particular one that we haven’t gotten to yet, just start searching. Studying and practicing these plays are the best way to build understanding of Fiore’s approach and how everything in the system ties together. But, of course, he can’t have a play for every possible combat scenario, so we also recommend expanding beyond the plays. A common approach for eastern modern arts are choreographed exercises known as katas. This can be applied to learning Fiore as well. Guy Windsor has done a lot of work in this area in his books and on his YouTube channel, both of which are linked on our other resources page. Give them a try! In our Intro to Fiore class we demonstrate one of Mr. Windsor’s drills as part of the discussion on training techniques, but we don’t end up teaching much or shooting video of katas because he has done such a good job of addressing this approach. Start by shuffling the cards. Stand in the stance from the first card. Step forward, deliver a strike to your imagined opponent and flow cleanly into the second stance. Choose a new second card, start from your previous end point and strike into the new stance. Continue, reshuffling the cards once you’ve run through the deck. Purpose: Teaches the fighter to move effectively from any pose to any other. Perform this drill while turning or retreating. Advanced: select a specific body part or quadrant to target your blow at. e.g. attack your imagined opponent on the upper right. When you shuffle the cards, change that target. If you can have a second person read the cards to you while you perform the drill, you can avoid the stopping and starting that selecting a new card entails and have a smoother, more combat appropriate, flow. Each fighter selects a random card and assumes the stance on the card. In slow motion, fighter 1 demonstrates an attack from his stance against the most open area on fighter 2. Reset to initial positions and let fighter 2 initiate combat and fighter 1 react. Repeat with two new cards. Purpose: Teaches the guards that work well together and the guards do not. (the “rock-paper-scissors” of the style.) This also develops the skill of identifying attack options. Add initial range to the drill. Create cards labeled “stretto/short” and “largo/long” and randomly select one for your pairing. Stretto represents a close range situation you have reached in mid-fight. Largo is a wider spacing and could be an initial situation, or a position you have reached after a brief break in combat. SCA fighters could use cards that say A, B, or C instead if that terminology is more comfortable. 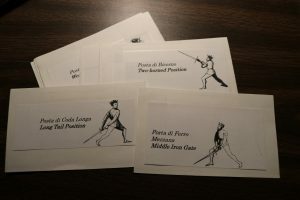 (A stretto/largo range card is included in the sword in armor/dagger flashcard set). Use two card decks so that both fighters may occasionally use the same stance. If one or both of the fighters intends to adapt the techniques to a full speed combat application (e.g. 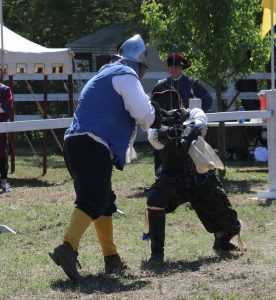 SCA armored or rapier combat), discuss any moves that are not allowed in that application’s ruleset and alternatives that are allowed. Armor up and try them. *For instance, if the initiator is in boar’s tooth and the defender is in window position on his left, the attacker can be pretty confident of a rising thrust into the defender’s belly. But, that leaves him completely open to whatever attack the defender wants to do up high. This is an unsafe choice. If instead the attacker passes his left leg forward and brings his sword up to high serpent (see sword in armor postas) he has covered his opponent’s sword, its most likely movement, and is in an excellent position to end the fight.